I’m a bit reflective this week. I look at our garden and my learning through it, and consider how far both have come and how infinitely much further they could go. With this in mind, here’s a few priorities that I think are worth considering in the first year of establishing a productive garden. Most of these apply even if it’s a rental property – with some slight variations. Plant a few fruit trees. Because it’s an exercise in patience and optimism. And because if you do this early, you’ll thank yourself in a few years when you are reaping the rewards. While you’re at it, create compost bins or heaps very close to the trees, ideally 6 months before planting, but if that doesn’t work out, plant your first compost bin next to a tree and shift it to a different tree every 6 months so they all benefit from the goodness. Temperate climate fruit trees are a good starter choice in Adelaide – e.g stone fruits such as apricot, peach, nectarine and plum – they grow fast, produce prolifically and are pretty unfussy. If you’re renting, choose dwarf fruit trees and grow them in large pots with good drainage. 2. Grow peas, beans and leafy greens for rapid rewards. You can’t beat greens fresh from the garden, and by growing your own you can pick just as much as you need, right when you need it. Bush beans (spring to autumn), dwarf peas and loose-leaf lettuces (autumn to spring) are all fine in containers or in garden beds and you can keep picking for weeks on end. Pop in a few more seeds each month to keep the goodness coming. To cover fences and trellises, choose climbing peas or beans. 3. Seriously improve your soil. If you can only afford to improve a small area, do that patch really well and then do a new patch each season. It’s worth the investment to get your soil microbes thriving because they feed your plants long-term. For tree planting, improve at least a square metre of soil with well-rotted compost, manure, gypsum (if you’re on sodic clay soil), rock minerals and mulch. And water it deeply, often enough to keep it from becoming crusty or water repellent. For larger areas, try sheet mulching or lasagne (no-dig) gardening. 4. Explore gardens in your community. Talk to other gardeners, ask them for cuttings and seeds from plants that do well in your area. On the whole, gardeners are a friendly and generous bunch. Plants that are happy in their environment will give you vital clues about what might succeed in your own garden, and how to position it. 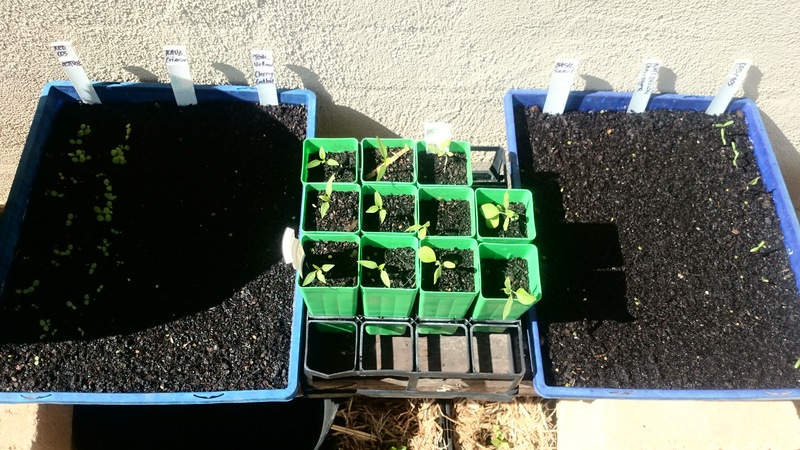 Share your own successes too – seeds, cuttings, fruit, vegetables – there are so many ways to do this now. Share with friends and family; start a regular swap with your neighbours; put out a box of surplus produce near your front gate with an invitation for others to take some; or swap or sell online. Because they are such good value and so forgiving. When you buy a bunch of herbs at the supermarket so much is usually wasted, yet it’s one of the most expensive ingredients in the dish. And often they are not very fresh and flavoursome. Home-grown organic herbs are an essential part of whole food cooking and the home medicine chest, with a place in every culture’s traditions. 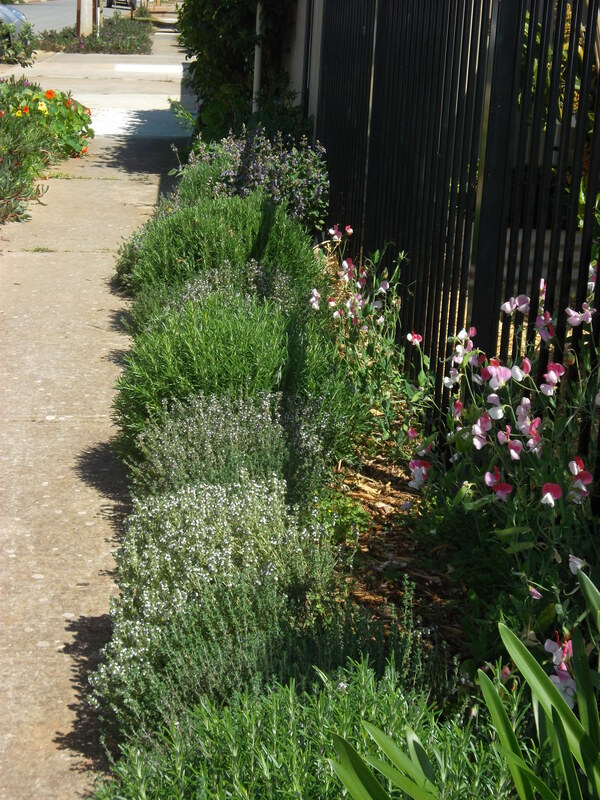 Perennial Mediterranean herbs such as rosemary, lavender, thyme and sage have very low watering requirements, grow readily from cuttings and make beautiful hedges and borders in the garden. Their flowers attract bees and native beneficial insects such as hoverflies, which help to pollinate fruit and vegetable crops. They are also useful companion plants to surround vegetables, confusing pests with their shape and scent. Basil and coriander grow readily from seed – basil in warm spring/summer, and coriander more easily in cooler months. Save the seed to plant again! 6. Create a comfortable sitting place – or three. This could be in or overlooking your garden. It’s a place to relax and enjoy; it’s somewhere that reliably gets you out into the garden even when you’re not ‘working’ the garden. It could be a hammock, an old plastic chair rescued from hard rubbish collection, a sheltered porch, a picnic rug under a tree – whatever invites you out every day, whether it’s for breakfast, a cup of tea, a sundowner or half an hour of quiet reading. Some of the best garden observations and ideas come when relaxing in the space and not really trying to achieve anything. It’s also a great way to meet the locals. 7. Get to know your microclimates. Hang out in the garden and start to think and feel like a plant, noticing where the sun shines and the shadows fall, which way the wind blows, where the rain hits and misses, where water pools or runs, where animals and people pass through. Notice how plants respond to these elements – are they lush and green, or sunburnt, wind-battered and dry? Learn about the requirements of your plants, based on the climate zones and soil types in their places of origin, and try to arrange them into similar conditions in your garden. This way they will thrive instead of struggling. 8. If you have children, make room for them in the garden and make it fun. 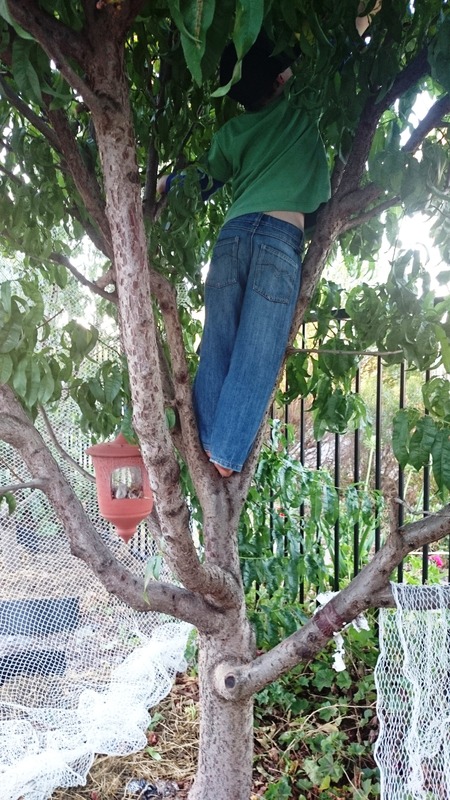 Climbing for nectarines. Boy and tree were planted in the same year and have been racing one another ever since. Incorporate opportunities for both gardening and general play in ways that are appropriate to the ages of the children. Kids who get to experiment with plants, seeds, real tools (not toy garden tools that break in the first week) and soil quickly learn what causes plants to live and die, and make better companions for your garden as time goes on. They are also much more likely to eat their vegetables if they have helped to grow them! Allow more time than you think you need to plan your garden, prepare soil, grow plants, and do any garden task! Don’t bite off more than you can chew – work on a patch at a time and when it’s pretty much looking after itself, move on to establishing the next patch. This is likely to be more successful than clearing a huge area, planting a lot of trees and plants that you haven’t grown before and then suddenly having to keep up with their individual needs throughout the seasons. It’s much more effective to spend a few minutes in the garden every day than a whole day once a month. Growing your own plants from seeds and cuttings means you can escape the consumerism that surrounds the retail nursery industry. It gives you access to a far wider range of plants, including heirloom varieties, organically grown vegetables and herbs, and enables you to save seeds that are perfectly adapted to your conditions to share and to re-grow in future seasons. There is something tremendously satisfying about being able to participate in the full cycle of germination, growth, harvest, decomposition and rebirth that propagation offers. Our ancestors passed this knowledge down through every generation. I am convinced that it lies dormant in all of us, waiting to be reawakened, and that when we rediscover our own growing roots we also reconnect with a deeply important part of ourselves and our place in nature. WARMEST THANKS to all the keen gardeners who have contributed to Nadja’s Garden reaching 1000 likes on Facebook this week. Thank you so much for sharing and interacting on the page. My Facebook snippets are much more regular than my blog posts because that’s where most of the community is active, but you’ll still find the monthly gardening column and other events posted here. Happy spring! This entry was posted in permaculture design and tagged fruit, permaculture, planning, planting, starting a garden, vegetables. Bookmark the permalink.